Can I get there by Candlelight? 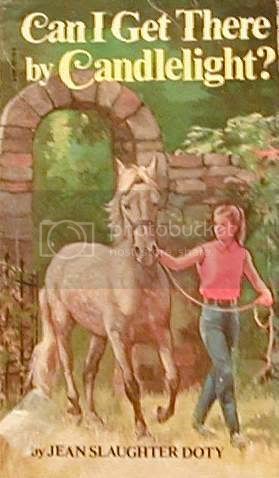 by Jean Slaughter Doty is the tale of a young girl and her pony who are mysteriously transported back in time. Gail and her parents are temporarily renting a very old home whilst waiting for their new home to be built. We learn that their home was originally the coachman’s cottage of the once beautiful Babylon estate. One day whilst riding her pony Candlelight (Candy) through the nearby woods, Gail discovers a decrepit iron gate which is almost hidden from sight by plant overgrowth. Curious to see what is hidden beyond, Gail opens the gate and steps through, only to discover that both Candy and herself have been transported back in time to the original Babylon of a century past. Gail Simmons - The heroine, a teenage girl. Hilary Blake - A girl of a similar age to Gail, but in other ways worlds apart! Candlelight - Gail’s beloved pony. As an avid reader and collector of pony fiction books, I was intrigued with the concept of Candlelight. I had heard how unusual a story it was, so you can most probably understand and share in my delight when I finally located a copy standing rather forlornly on a dusty shelf, hidden away at the rear of a second hand bookshop. I must say that finding my copy in this manner seemed to tie in perfectly well with the historical content of this book. Like our main character Gail, I felt as though I too had stumbled upon something mysterious which would be forever etched in my mind. This is a haunting and original novel which appealed to me primarily due to its mixed storyline. Although a relatively short novel, it is extremely well paced and features terrific suspense. The storyline has been kept simple and has not been run away with. As well as in keeping with the popular theme of bond between a young girl and her beloved pony, the author has successfully managed to weave a few other plots into the story. All in all this creates a most unusual novel. For not only do we have a historical element which features times and ways of centuries past, at the same time we also have an intriguing fantasy/mystery regarding time travel on our hands. We ponder possible links as to why Gail was able to travel back and forth in time and wonder if there was a specific reason was for her journey. I felt there were many clues provided throughout the novel, however I could not pinpoint a solitary answer which in my opinion made the story all the more mysterious. In this sense, I feel the author has encouraged the use of our own imagination in order for us to provide our own personal conclusion. A further highlight to me was the book’s profound sense of eeriness. I felt the author was artistic in creating a strong supernatural element, which in my opinion allowed for a wonderful atmospheric background to the story. In this book, the contrast between two worlds (ie the present and the past) is displayed in vivid detail. We have two completely different worlds which we are transported through. In the beginning of the book we are exposed to Gail’s world which includes modern everyday realities such as property development and suburban growth, her busy businessman father enduring lengthy travels for his job in order to support his family and a family starting a new life together in a strange town. We therefore explore a lonely young girl’s take on life in the modern world. In direct contrast to this, we are also given an insight into the days of yesteryear. Joining Gail on her journey back in time, we discover what life may have been like for our predecessors. We are introduced to Gail’s friend Hilary, and learn how Hilary’s world represents our past. Thus we are introduced to another young girl’s viewpoint on life, only this time to the days of yesteryear. I feel the author has gone to great lengths to study the days past. The description of Hilary’s life at Babylon was distinct and clear - it felt as though I too, had mysteriously stepped back in time. For instance, I could clearly envisage myself dressed in a habit and riding sidesaddle, being under control of a governess and also spending my days as a lonely girl wandering through a large estate looking for something to occupy my time with. In a personal sense, this aspect of the novel made me appreciate the many simple luxuries and associated freedom which we often take for granted in today’s modern world. It made me realise just quickly the world has changed over a relatively short space of time. In my opinion, this was an exciting aspect of the novel cleverly encouraging for the use of our imaginations once again. Thus this was not a story that I simply read for the sake of reading, it was also a novel which made me think outside the square, so to speak. Another plot device which I felt the author mastered successfully was that which concentrates on the theme of friendship. We are given an insight as to how special friendships evolve and learn that sometimes, due to situations beyond our control, how they can also sometimes sadly fail. We explore Gail’s feelings in this respect in her friendship with Hilary. Gail, having travelled back and forth through time, is aware that her relationship with Hilary cannot ultimately last forever, yet she is happy to continue her friendship with Hilary. This element lends a slightly dark tone to this book, however in my opinion it was also uplifting in the sense that it made me realise that we must treasure what we have, whilst we have it. Overall I thoroughly enjoyed this book. To me, the conclusion of the novel was slightly abrupt however I do feel the author has instigated this move on purpose in keeping with the element of mystery. I felt it was a highly unusual story which should appeal to those who not only love ponies, but also to those who enjoy a story filled with magic, mystery and imagination. In my opinion it has been cleverly constructed, the plot is simple yet will allow your mind to ponder in an unrestricted sense, as such I would be most interested to learn your own thoughts of this masterful novel. Candlelight has been aimed at captivating the younger reader but I can most definitely see it appealing to the more mature reader as well. Spine-tingling stuff! I would rate this novel 4 horseshoes. i love this book it just flows so nicely great summer day read! Have you read any other of her books? I have read Summer Pony which was OK but nothing outstanding. Claire...I grew up on Doty and have all her books. Summer Pony and it's sequel, Winter Pony, as well as Valley of the Ponies are generally wish fulfillment for the younger set...no better or worse than any other girl-gets-pony story, though if you had read them as a child you'd probably have affection for them. Her best two book, in my opinion, are The Crumb and The Monday Horses (both stand alones)...the former is very easy to find and inexpensive, the latter tough to find and somewhat pricey (not by any means over the top, but more than you'd expect.). Both came out in hardcover and in paperback. Btw, paperbacks in the US are virtually never revised or abridged in any way, unlike some of the pony books reprinted in pb in the UK, though they may be missing illustrations, or have revised illustrations. The picture factor doesn't apply to these two, as neither hardcover nor paperback are illustrated. Dark Horse is very worth reading, so, to a lesser extant, is Yesterday's Horses (though that one has it's fans too). If Wishes Were Horses should be avoided at at all costs. Her one dog book, Gabriel, is a good read if you come across it, but I wouldn't suggest breaking the bank for it. Thanks susan some very useful info for us Brits who may not have read many of her books. I did like Candlelight a lot, possibly thats why I found Summer Pony a tad disappointing, tho still quite enjoyable. You dont see the books over here very often however. Interesting to note that USA books are not usually revised in PB as are many of ours. The only one I had read was 'If wishes were horses', and so I couldn't raise any enthusiasm for reading another of hers, now I think I will have to give her another try, as I like the sound of the Candlelight one. Have a real soft spot for alternate time line type stories!! Candlelight is brilliant Kunuma...do it...I ahven't read any of her others though. I find it hard to imagine the title The Crumb being anything but crumby though! I didn't think much of If Wishes Were Horses but really liked Candlelight. Much better than Summer and Winter Pony as well. haffy....The Crumb is the pony's name...it's short for Buttercrumb Cake (he's a buckskin). It really is worthwhile if you come across it. Great review I love books like this. I will definitly try and get a copy. Is this writer english? is the book set in england? Sorry just seen the auther is american. I really enjoyed this book but agree that the ending was rather abrupt.I would have liked to know if Hilary was ok ideally, I would have liked Gail to have found this out by reading history books. Btw my copy is paperback. Konsanze....you've got all Doty's horse work, she just did the 9 books you listed...Gabriel is a Keeshond (lovely Ted Lewin illustrations). She did at least one non-fiction riding instruction book, and edited/arranged a book of Christmas carols, but that's the lot. Re the "not illustrated", I was referring to The Crumb and The Monday Horses only, as they had just cover art (Claire was asking about other books by Doty, and that's what I was responding to). I have the same edition of Candlelight as you do, and it's got the Ted Lewin illustrations. I've just read this and absolutely loved it! I couldn't put it down. Agree with others that the ending was a bit abrupt though. I felt another chapter explainig what happened to Hilary would have finished it off nicely. But as Claire said maybe the authour wanted to finish on an air of mystery rather than tie up the lose ends. I thought you would enjoy it rosie. I don't think I've met anyone who doesn't like it. BTW I didnt write the review. It was someone called Ree, a lovely Australian girl who helped me when I first set up the website, but sadly we have lost touch. Ooops apologies to Ree. I went straight to the review bit. Dont worry about it Rosie. Quite a few people have made the same mistake as she did a few reviews which I posted under my name. I just don't want to take credit for other people's efforts! Glad you posted here as it has reminded me not to bother with If Wishes Were Horses. However I do find the blurb for another of the authors books Yesterday's Horses intriguing. Has anyone read this one and would they recommend it? I read this at the weekend and enjoyed it. It's very slight, but well done. The practical part of me would have liked the ending to be tidied up, but it's probably stronger as it is, and suits the dreamy unreal atmosphere of the story. I thought the personality of Candy came through strongly, which I always like in a pony story.